Their operation was discovered several weeks ago, when a Pierce County Sheriff’s Deputy in the Mountain Detachment was driving on State Route 702. As he passed Christensen Muck Road he suddenly smelled a very strong odor of marijuana. The deputy recalled a conversation he had with a local resident two weeks earlier when the neighbor told him about a property on the 3800 block of Christensen Muck Road which reeked of marijuana. 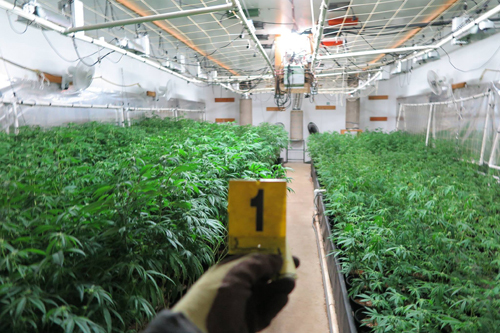 The deputy contacted the Washington Liquor and Cannabis Control Board to inquire whether there was a legal grow, processing, or distribution operation at the property. There was nothing legally registered with the state. The deputy obtained a search warrant for the power bills and learned that the property was the largest consumer of electricity from OHOP Mutual Light Company, using nearly 2.5 times as much as the second highest consumer. According to the Pierce County Sheriff’s Office, The average residence uses approximately 10,000 Kilowatts of power per year; the property on Christensen Muck Road was using over 300,000 KW per year. The deputy used this information to obtain a search warrant for the shop and home, which was served late last week. Inside the shop the search team located and dismantled a massive illegal grow operation which included more than 2,800 marijuana plants, numerous grow lights, fans, large charcoal filters, timers, and elaborate watering and humidifying systems. The Sheriff’s Office estimated the total street value of the illegal grow operation at more than $1.4 million per quarterly harvest.